The King's flag I recently saw in Thailand was quite different from the royal standard in FOTW (Garuda on yellow background). The King's flag is his crown shape and his Thai character initial in red below on bit [sic  'field'?] dark yellow. The shade of yellow is the same as of Thai Monks clothes or that used in the Sri Lankan flag. The flag itself honours both his Majesty the King and the Cakkri [sic] Dynasty as a whole; not only does it demonstrate the pride which the Thai people take in having such a talented monarch-one who has ruled the country for over 50 years; it also celebrates the nation itself, its long and distinguished history and its unique art and culture, as well as the national character in general. This is yet one more of King Bhumipol Adulyadej a.k.a. 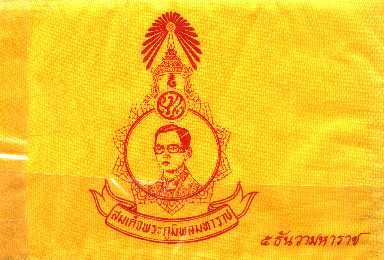 Rama IX's personal flags, since it bears his cypher. What for and when is each flag used still remains obscure. Nozomi mentioned that some of this flags are used to salute the king (at parades etc.) but also by the king himself. And of course there is also the royal standard.